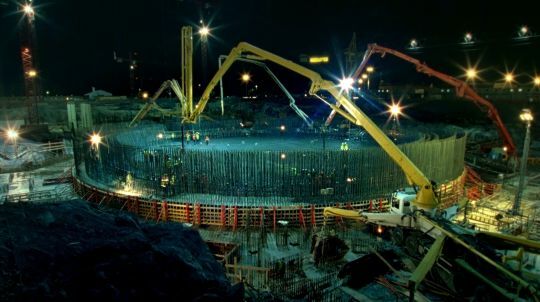 In 2002 Finland allowed the fifth nuclear reactor to be built in its country. It is the first reactor to be built after the Chernobyl accident. It was supposed to bring a new nuclear dawn- the trouble is that there are all sorts of problems in building it and it is now nine years behind schedule. This is a portrait of Eurajoki the small Finnish town that is the home of three nuclear reactors including the one that is currently being built. The film looks at the project from every angle, from the town council, to the workers and to the regular people. It is a portrait of the modern age of atomic power. RETURN OF THE ATOM is a ood but over long look at atomic energy in theory and in practice. Its a warts and all look at everything you ever wanted to know about atomic energy and it's use in the modern age. It has a lots of really cool visuals (I love the time lapse construction bits) and it lets us explore the plant and what it means from most angles. The major problem is the film tends to let some sequences go on too long. The opening bits using old footage is much too long, while others go on past the point where its making its point. To be honest somewhere about a third of the way in I stared to tune out and nod off. A minor problem, which is my own, is that between several recent film festivals I've seen a great deal of this covered in other films, including the nowhere near as good INDIAN POINT which played at Tribeca which also split its time between people on the various sides of the atomic energy issue. Perhaps if the film hadn't been so slowly paced I wouldn't have minded rehashing some of the issues. The film has two more screenings at Toronto. For tickets and more details go here.